After years of hardworking, it is the time to write your research thesis, an important aspect of getting the coveted degree (MS or Ph.D.). 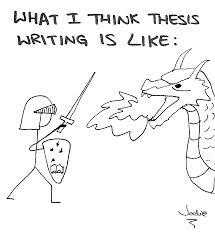 Writing thesis is probably one of the hardest challenges in your academic career. However, a little planning in advance may simplify such challenge. So, do not panic and start the planning in the beginning of your final year research. First, know your institution’s requirement for a research thesis to be fulfilled e.g., minimum volume of work required to write a research thesis. Of course, volume of work is not same for a MS thesis and a Ph.D. thesis. However, the planning and organization are same in both cases. This article mainly discusses the plan for writing Ph.D. research thesis. Always target a date for completion of the first draft of your research thesis and then divide this time to complete each of the chapters. Try to stick to your deadline. Be clear about the objective of your research thesis. Do in-depth literature survey for writing the “Introduction”, the beginning of your research thesis. The “Introduction” should include a complete literature review of your field at least for past 20 years including couple of classic/ breakthrough works done before 20 years, if your field is not so new. Read some basic books related to your field to understand the broader knowledge. Your “Introduction” should end with the “research question” or “objective” or the reason to undertake the particular project. Plan the chapters and organize the chapters in such a way so that there remains a logical flow of the content throughout the theses, chapter after chapter. After going through a research thesis, a person should get a clear idea about the objective with which you started the research work and how far you achieved. Now plan for each individual chapter of your research thesis. Make notes point by point regarding the content of each chapter and arrange the things accordingly. While writing each chapter, divide the chapter in different sub-divisions with introduction, methods, results and discussion (IMRAD) and conclusions. Method section should be described in detail. All the research technique/ experimental/ theoretical modeling should be presented clearly. Therefore, sit with your lab notebook for exact description of the methods you used. Ready all the figures, graphs, and tables needed for writing the result and discussion. Most of us struggle how to start. Procrastination should be avoided. A small tip regarding writing individual chapter: first arrange your figures, graphs and tables and then you will find that the story has automatically developed in front of you. Therefore, start writing with your result section. Make sure if your university has some recommended wordcount for research thesis. Then accordingly plan each chapter, so that together they do not cross the recommended word limit. 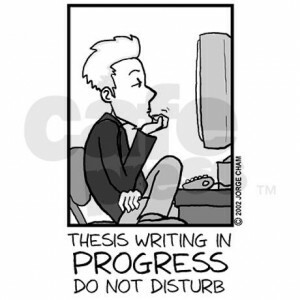 Generally Ph.D. research thesis has more or less a common structure. However, check with your university research thesis guidelines, and a senior labmate’s (one or two year senior to you) thesis would be helpful in this regard. 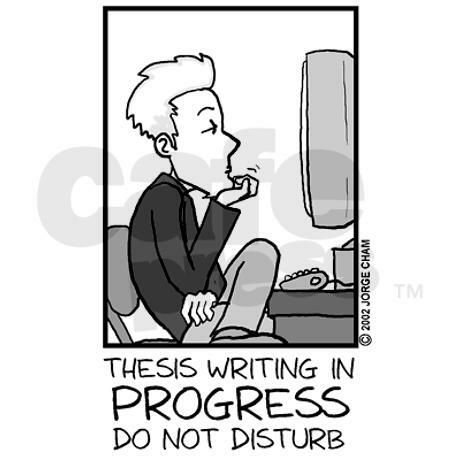 Try to think your research thesis as a story and develop it accordingly. Work on each chapter in such a way that thesis as a whole is interconnected and tells a story of a scientific invention starting from the history of the particular field (how the field evolved: “Introduction”), which are the interesting points that one needs to address for further advancement of the field (“Objective” of your work or” research question”), what can be done to address those issues or how to further develop the field (individual “Thesis Chapters”), how far you achieved (“Conclusions” including any limitation and future application or study to develop further).